Tstetes flies have been eradicated in an entire region of Senegal. This victory was due to be announced by Senegal's president at a ceremony on Dec. 8. It is the fruit of a longstanding collaboration between CIRAD, the Institut Sénégalais de recherches agricoles (ISRA), Senegalese veterinary services, the Ministry of Agriculture and the International Atomic Energy Agency. After several other stages, releasing sterile males finally eradicated the last remaining wild tsetse flies. In the coastal Niayes zone of Senegal, meat and dairy production is set to increase substantially in the coming years. This is a boon for the region, which is home to 80 percent of the country's population. 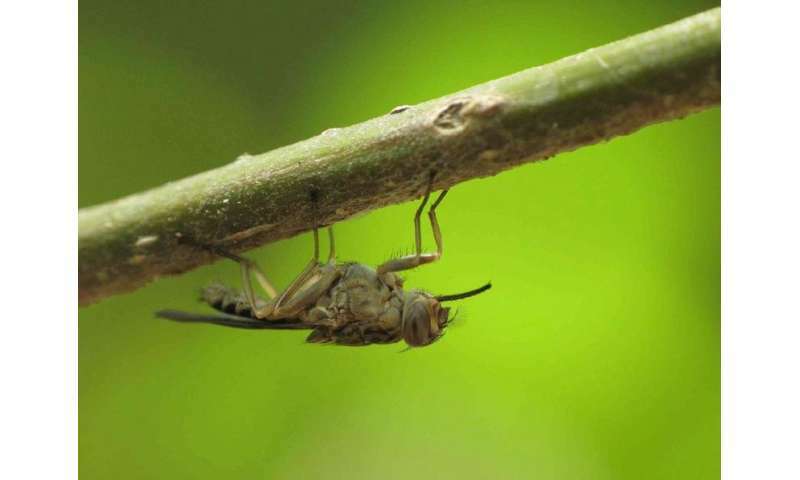 Tsetse flies transmit parasitic diseases called trypanosomiases. In humans, they cause "sleeping sickness," which can be fatal if left untreated. In cattle, the infection causes reduced fertility, weight loss and sometimes death. Tsetse flies are a substantial obstacle to development of the livestock sector throughout sub-Saharan Africa, including in Senegal, where 80 percent of the milk consumed is imported. The target zone for eradication operations covered 1000 km² of the Niayes region. Before operations began, the genetic isolation of the tsetse fly population had to be proved and their presence mapped in detail. "A previous programme in the 1970s began when only half the infested areas had been pinpointed. This doomed it to fail," says Jérémy Bouyer, a veterinary surgeon and entomologist with CIRAD currently posted to the IAEA, who has been working on the project since 2007. The methods developed by researchers from ISRA and CIRAD have enabled substantial progress, including a 90 percent reduction in sampling costs. The project used socioeconomic studies and herd surveys to draft its eradication strategy. The operational phase then began in 2012. Installing insecticide traps and treating cattle reduced tsetse fly population levels, and releasing radiation-sterilized males wiped out the last remaining wild flies. The pupae (fly nymphs) used came from the Bobo-Dioulasso insectarium and the Centre International de recherche-développement sur l'élevage en zone subhumide (CIRDES, Bobo Dioulasso, Burkina Faso). This sterile insect technique has proved itself as a way of controlling many insect pests and vectors, such as fruit flies. At the start of the project, we were capturing up to 100 tsetse flies per trap each day at some sites," Jérémy Bouyer recalls. "By July, we were finding one or two per month. We're now down to zero!" Eradicating tsetse flies will allow farmers to switch from disease-resistant cows, which are less productive, to more productive breeds. The resulting increase in production should generate around €2.8 million a year, according to the impact study conducted alongside the project. There is already another visible spin-off: a reduction in the areas cultivated by livestock farmers, a major issue given current levels of land pressure. Buoyed by the eradication programme's success, the Senegalese authorities are planning to extend it to a 5000-km² zone of Sine Saloum. The tsetse fly problem is even more acute there, since they transmit two species of trypanosomes, one of which is much more virulent. The results in Senegal fit into a vast pan-African tsetse fly eradication campaign (PATTEC) launched in 2001. CIRAD supported three national programmes, in Burkina Faso, Guinea and Senegal. "CIRAD played a role in knowledge production, training, and capacity-building, as well as in fostering a multi-partner network including policy-makers," says Sylvie Lewicki, CIRAD Regional Director for West Africa- Dry Zone. Eliminating the fly or the disease?